The Fiocchi 12 gauge 1 ounce #8 shot is the pinnacle of where economy meets performance. 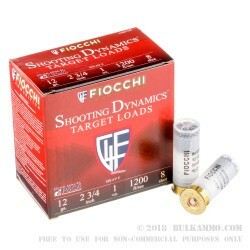 Ideal for high volume clay target shooters who can go through upwards of 400 - 500 rounds per day, the Fiocchi 12ga 1 ounce #8 shot provides a dense, hard hitting shot pattern than even the most high volume of shooters can afford to shoot on daily basis. Using only first run, chilled shot dropped lead, the Fiocchi 12ga 1 ounce #8 shot is less susceptible to shot deformation upon ignition of the primer. 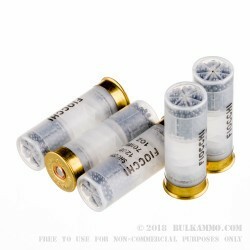 Whereas cheaper ammunitions will compress and loss their spherical properties upon ignition of the primer, Fiocchi ammunition is less susceptible due to the inherent quality and hardness of the lead. 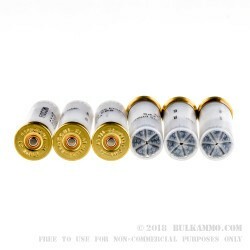 Brass headed cartridges make for a smooth extraction and ejection of spent shell casings, and the six star crimping keeps the contents sealed and protected from external forces until you are ready to fire. 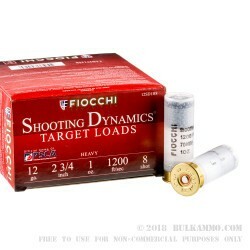 Competition shooters looking to improve their training performance and reduce cost should look no further than the Fiocchi 12ga 1 ounce #8 shot.